The Music Ontology is much easier to read with the new documentation and the normalized terms. In fact, Yves Raimond worked hard on this new release with some help from Chris, me and other people on the mailing list. The list of major changes is available on Yves’s blog post about the release. Also, the complete list of changes is available in the change log. Some things have yet to be finished related to this new revision. We have to update the examples on the wiki. And I have to modify the Musicbrainz RDF view that the generated RDF documents reflect these changes. Finally this new revision is a major upgrade related to the user-friendliness of the ontology. Terms, descriptions and documentation of the ontology should be much clearer now. Musicbrainz’s dataset can finally be browsed, node-by-node, using URI dereferencing. 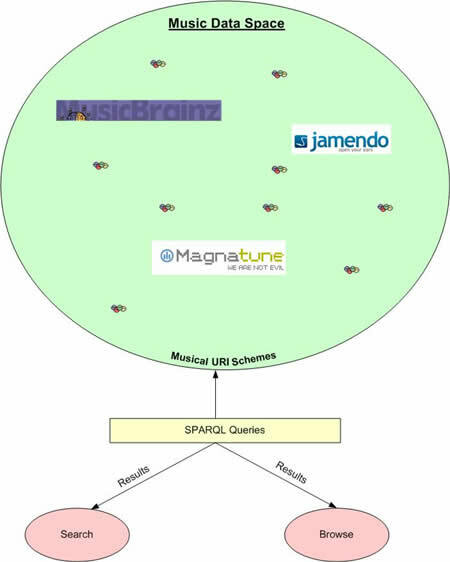 Since the Musicbrainz relational database has been converted into RDF using the Music Ontology, all relations existing between Musicbrainz entities (an entity can be a Music Artist, a Band, an Album, a Track, etc.) are creating a musical relations graph. Each node of the graph is a resource and each arc is a property between two resources. Welcome in the World of RDF. 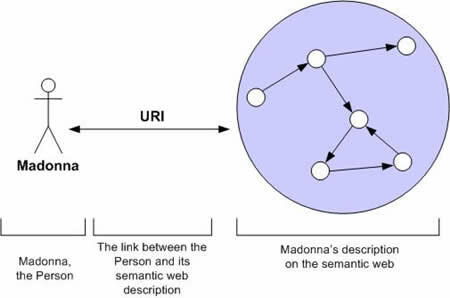 This means that from a resource “Madonna” we can browse the musical relations graph to find other entities such as Records, People, Bands, Etc. These URIs are not only used to refer to Musicbrainz entities. In fact, these URIs are used to refer to any Musical Entities that you can describe using the Music Ontology. 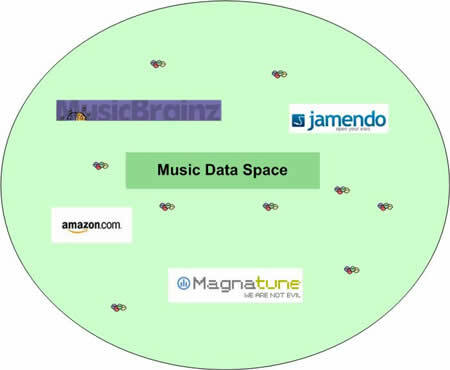 In a near future, the Musicbrainz data will be integrated along with data from Jamendo and Magnatune. In the future, we will be able to integrate any sort of musical data at the same place (radio stations data, user foaf profiles relations to musical things, etc.). So from a single source (http://zitgist.com/music/) all these different sources of musical data will be queriable at once. All these URI schemes terms refer to their Music Ontology classes’ descriptions. I am getting closer and closer to the first goal I set to myself when I first started to write the Music Ontology. This first goal was to make the Musicbrainz relational database available in RDF on the Web. Months later and with the help of the Music Ontology Community (specially Yves Raimond that worked tirelessly on the project) and the OpenLink Software Inc. Team, we finally make this data available through URI dereferencing. From there, we will build-up new music services, integrate more musical datasets into the Music Data Space, etc. It is just the beginning of something much bigger. I introduced a Virtuoso RDF View that maps the Musicbrainz relational database into RDF using the Music Ontology a couple of weeks ago. Now I will show some query examples evolving a special feature of these Virtuoso RDF Views: full text search on literals. A Virtuoso RDF View can be seen as a layer between a relational database schemas and its conceptualization in RDF. The role of this layer is to convert relation data in its RDF conceptualization. That is it. You can see it as a conversion tool or as a sort of lens to see RDF data out of relation data. Recently OpenLink Software introduced the full text feature of their Virtuoso’s SPARQL processor with the usage of the “bif:contains” operator (it is introduced into the SPARQL syntax like a FILTER). When a user sends a SPARQL query using the bif:contains operator against a Virtuoso triple store, the parser will use the triple store’s full text index to perform the full text search over the queried literal. With Virtuoso RDF View, instead of using the triple store’s full text index, it will use the relational database’s full text index (if the relational database is supporting full text indexes, naturally). Note: if the system asks you for a login and a password to see the page, use the login name “demo” and the password “demo” to see the results of these SPARQL queries. FILTER bif:contains(?album_title, “Press and Play”) . As you can notice with that query, the user will use the full text capabilities of Virtuoso over two different literals: the objects of these two properties foaf:name and dc:title. FILTER ( xsd:dateTime(?creation_date) > “1990-01-01T00:00:00Z”^^xsd:dateTime ) . FILTER ( xsd:dateTime(?creation_date) < “2000-01-01T00:00:00Z”^^xsd:dateTime ) . Here the user will use the full text capabilities of the Virtuoso RDF Views to find artists with the name Madonna and he uses two filters on xsd:dateTime objects to find the albums that have been created between 1990 and 2000. In this last example, the user wants to know the name of the members of the music group U2. Here the user will use the full text feature to get the name of the music group, then the name of the members related to this (these) music group(s) will be returned as well. Some full texts operators can be used in the literal parameter of the bif:contains clause. The operators are the same used in the full text feature of Virtuoso’s relational database. A list and a description of the operators can be found on that page. I would only add that the near operator is defined as +/- 100 chars from the searched literal. And the wildcard ‘*’ operator should at least be placed after the third character of the literal. So, “tes*t” or “tes*” or “test*” are legal usages of the wildcard operator, but “*test”, “t*” or “te*st” are illegal usages of the operator. Finally, as you can see, the full text feature available with the Virtuoso RDF Views is a more than essential feature that people should use to increase the performance of their SPARQL queries. The only two other options they have are: (1) using a normal “literal” that as to be well written and with the good cases; in one word this option render such queries useless and (2) they can use a FILTER with a regular expression with the “I” parameter that is far too slow for normal usages.